Well-drained soil with plenty of compost dug in. Yes, but leaves and shoots die back. Mulch with extra compost each year after the leaves have died down. Grown from a crown (root) which can be split from a healthy plant and planted out, usually in winter. Can also be purchased as seedlings during warmer months. 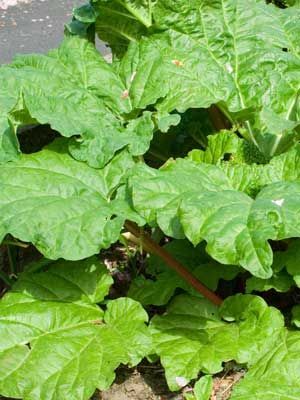 Early sweet stems can be produced by forcing and blanching the rhubarb: in mid winter to early spring add dry material such as leaves or straw and cover with a deep container or bucket to exlude light for about one month. Do not harvest during the first year of growth. After this, pull a few of the thicker sticks when long enough. Stop harvesting in early summer and allow plants to grow freely for the rest of the season.